Fr. Aaron Foshee grew up in the small town of Jones, in Eastern Oklahoma County. At Easter of the year 2000 he came into the Church, along with his immediate family, at St. John the Baptist Catholic Church, Edmond, OK. He was an active member of the homeschool community of Central Oklahoma throughout high school and graduated in 2005. He went on to Oklahoma Baptist University, where in May of 2009 he graduated with a Bachelor of Music in Vocal Performance. The fall of that same year he began his seminary formation at St. Meinrad Seminary and School of Theology for the Archdiocese of Oklahoma City. There, he received a Master of Arts in Catholic Philosophical Studies in May of 2011 and a Master of Divinity in May of 2015. He was ordained to the priesthood on June 27, 2015. 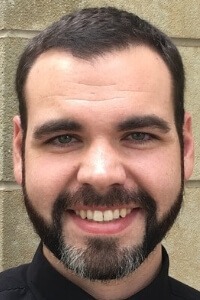 His first assignment by Archbishop Paul Coakley was as the parochial vicar of St. Francis Xavier parish and St. Gregory the Great parish in Enid, OK, and St. Michael Parish in Goltry, OK.
On June 27, 2017, Archbishop Coakley reassigned him as parochial vicar of Christ the King parish in Oklahoma City, OK.
His most recent assignment came on June 18, 2018, when Archbishop Coakley appointed Fr. Foshee as pastor of St. Joseph parish in Ada, OK, and St. Francis Xavier parish in Sulphur, OK.